Some stuff we enjoyed on the internets in 2010. The most fun games we played in 2010. I love the original Picross in a rather pathetic manner, replaying it at least 3 times now. It’s basically a puzzle game, a bit like a cross between Sudoku and Minesweeper. Anyway, I bought the new game for the plane trip to Japan and it’s very addictive. Instead of working on a flat grid, you now knock away cubes to reveal an object. I say ‘object’ as if these are in any way recognisable – even once they colour it in and go ta-da! I’m usually going oh, yes, it’s um… OH ‘man looking through window’, of course. Still fun though. Even better, each completed ‘object’ is added to one of many themed landscapes, and again, I say ‘themed’ like they’re not totally hilarious stuff like ‘things with sharp edges’, ‘things that come out when it rains’ and my favourite ‘things required for relaxing by a fire’. The in-game music is also so incredibly brainwormy, I can quite literally whistle the songs from memory. 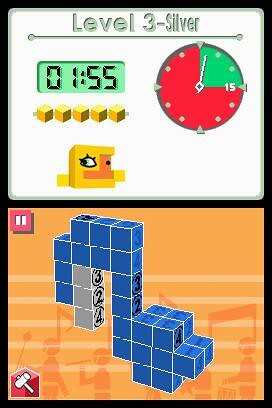 I do however, have one very big problem with this game, which is that they’ve tried to fun it up by having a…a…one-eyed cubeduckchickalien (srsly, WHAT IS THIS?!) around at all times being weird and wrong. The sarcastic way it double-takes when I complete a level makes me want to punch the screen. Also, I bet they’re really regretting the 3D title now actual 3D gaming is all but upon us. Our favourite books of the year. The best films we watched in 2010. Our favourite singles and songs of 2010.